If there’s one thing we’ve learned at Google’s I/O Developer’s conference, it’s that Android is on the verge of going everywhere. Android TV puts the operating system directly in your living room entertainment center, while Android Gear puts the OS on your wrist. And later this year, Android will be heading to your car, too, thanks to Google’s just announced Android Auto, an in-dash operating system that aims to keep you connected while driving without needing a hand on your smartphone. Android Auto focuses primarily on the apps you’ll need while driving – GPS navigation, music, and basic communication, all powered by contextual “OK Google” voice search. Navigation uses the familiar Google Maps app, while music and entertainment will come from your choice of apps like Spotify, Stitcher and Pandora. Android Auto lets you receive and send text messages using voice, allowing you to keep your eyes on the road at all times. There are plenty of predictive Google Now notification cards, too – Auto can pull your dinner reservation confirmations from your Gmail and automatically put directions on the screen, letting you know exactly when you’ll need to start driving to make sure you get there on time given current traffic conditions. Another cool feature: The Android Auto experience actually upgrades itself as you upgrade your phone, making sure your expensive in-dash computer won’t be obsolete the moment you drive it off the new car lot. Indeed, Google Auto will be available in new cars from virtually every major manufacturer, including Acura, Audi, Chevrolet, Chrysler, Dodge, Ford, Honda, Hyundai, Jeep, Kia, Mazda, Nissan, Suburu, Volkswagen, Volvo and more. Aftermarket Android Auto units are sure to be forthcoming for your current car, too. 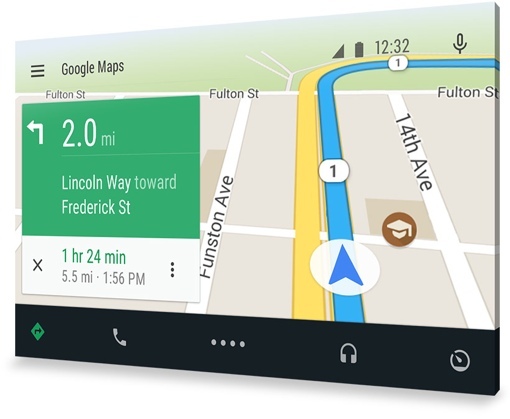 Android Auto launches later this fall, just in time to compete with Apple’s iOS in the Car. You can learn more about Google’s in-car OS at android.com/auto.